The-once-and-for-all-declutter. My biggest success was streamlining the kitchen cupboards, giving everything a thorough clean and reorganising our storage in this room. Making joint decisions with my husband meant more radical action was taken. We now have only 4 white mugs that match although we do have some white cups and saucers for entertaining. Our worktops are clearer and the room is easier to clean. I've also ventured into the loft and donated any clothes that were stored there. This is quite a big thing for me. The final stage of clothes decluterring was dealing with the 'donate in 6 months' box. It means all the clothes that I own are in my wardrobe and not squirrelled away in reserve. I also got rid of 3 old suitcases that were in the loft and emptied some boxes of random items from our last move. I still have photos to edit and electrical wires to sort. Decluttering big areas like the kitchen and loft inspired me to tackle smaller areas like consolidating 3 address books into 1. Be Fabulous. I have definitely walked more often during the project and realised it's probably my favourite way to exercise and meditate at the same time. The gentle rhythm of walking and the delight in opening my eyes and mind to new horizons as I walk soothes my mind but stretches my body at the same time. It's great to walk alone or with someone else and walking for the sake of walking (instead of getting to a destination) is a simple indulgence. I've maintained my running during the project but it's sometimes felt like a chore. It's taken a lot of motivation to keep running 2 or 3 times a week. My meditation practice has improved but again at times I've resisted it and missed more days than I care to admit. Reading Wherever You Go, There You Are by Jon Kabat-Zinn was a great insight into how to use everyday life moments as time to be, accept and learn. Finding Focus. I enjoyed blogging about the project but found it difficult to produce extra motivational pieces for readers. This is partly bevcause I found the extra decluttering quite draining and also I've been teaching more hours than usual during 3 out of the 4 weeks of the project. It's led me to think about planning my time better and making time for writing more of a priority. I have some new ideas for Just a little less which I'm looking forward to developing over the summer. I've found it hard to reduce my online time and this will be a priority over the next few weeks. Being selective with my blog reading, setting time limits on screen time and remembering that online lifestyles whilst inspiring can also be damaging and lead to lifestyle envy are all important. The Eisenhower Decision Principle will, I hope, help me to improve my time management. Try Something New. This is an area where I think my readers had more success than me! Whist I've had some fun and enjoyed simple pleasures it's made me realise the importance of planning more time for fun. Time to draw up a list of fun things to do. Overall, I think the project has made me realise what's important to me and more aware of what gets in the way of my progress. I've enjoyed decluttering and making my home simpler. I've learnt the simple pleasure of daily walks. I've discovered that's it healthy to see my failures as an opportunity to learn more about myself and that they'll lead me to make changes in the future. 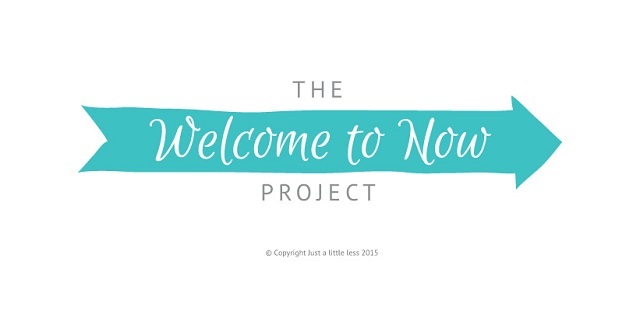 The Welcome to Now Project has made me more determined to find ways to simplify my life. It's helped me to practise daily habits and given me the motivation to declutter some difficult areas of my life. It's made me understand that now is good. So, how did you get on with the project? What have you learnt about yourself? Please share. Hello Teresa and thanks for commenting. You've done so well with your decluttering - think of the possibilities now you are almost clutter free! I set out to walk more and eat better. We definitely did the walking 5 nights out of 7. Good news is that we estimated about 2.5 miles a night and on purchasing a pedometer it is actually 3.2 miles - no wonder I was tired. This is fast walking as well with the occasional 2 minute jog - so slowly getting there. Four pounds lost in a fortnight but have now hit a brick wall!! A bit of lost motivation recently due to a family upset (i.e eldest son has fallen out with me for the silliest of reasons and has not spoken for 4 weeks!!). Thankfully he lives in his own house but it's all very sad when this happens. Onwards and upwards though - and a trip to the Download festival was very enjoyable - saw one of my favourite bands that me & hubs first saw in 1986! Hi. Great results with the walking! Life happens doesn't it. I love festival fun too and enjoy this shared interest with my husband. Eating and exercise- two areas of my focus have had mixed success. I eat more fruit and drink much more water over Diet Coke but still consume lits of coffee and too many treats. I'm not exercising enough so more of that in my now needs to happen. Well done with the healthy choices. I'm no longer tempted by Diet Coke but I know how hard it is to fit exercise in and find the motivation. Claire, I don't think you should worry about not having written more motivational pieces. I am sure others would agree that what you have written about in the 4 weeks has been inspirational. Thank you. I realised that although I enjoyed 'lifestyle' blogs, they had become materialistic and we know things don't make you happy! So I have cut down on that. It was insightful to read the paragraph about walking, something you really enjoy - exercise and meditation, two birds with one stone. Why run?! Use that time to walk and enjoy it! Yep... been think the same. Pushing my running is not working for me right now whilst walking is. Thanks for your kind words. Wise words indeed. I agree, I want my blog reading to inspire me towards practising simplicity not feeling that I have to buy it. I think there can be several layers to decluttering. I did the first round & felt good, but eventually did another round & found still more 'stuff' to declutter. Each round finds less to get rid of, but there's usually something. I'm just not sure we're ever totally done, or at least I'm not. Like you, we just sorted through our mugs & I've also done the address book. Small things, but I felt a sense of accomplishment when they were done. I agree decluttering gets easier each time because there's less to deal with but it can still be draining on many levels. Small decluttering or organising sessions are much more enjoyable! Hello Claire, just wanted to say thank you for all your posts on this topic. I found it inspiring and also interesting to follow you along your journey. I managed to do some things myself, but mostly what I managed was to be mindful of the things I wasn't as well as the things I was doing, and reflecting on what the barriers were. Mostly what I learnt was that the barriers were mainly in my own head - I didn't do things either because at some level I didn't want to do them, or wasn't ready to do them; or else I was simply physically too tired to do them. So I decided about half way through that actually what I needed to do was to focus most of my energy on doing whatever I needed to on tackling the chronic insomnia I have had for a number of years now. Initially it was due to stress, health problems, and lots of difficult stuff with ill and needy parents, but somewhere along the way it seems to have become a body habit. I'm pleased to say that I'm now three weeks into a much improved sleep pattern, which has reaped amazing benefits in terms of my ability to do all sorts of other things. So I haven't (yet) got started on running. But I am now sleeping at least 6 hours a night, which just feels amazing. And I'm now making a start on some of the other areas of life I want to develop. So - a heart-felt thank you for the inspiration to get started on this! And good wishes with your continuing moves in your own life. I found it hard to increase my exercise whilst having quite physical sessions doing the decluttering at the same time. I surprised myself by wanting to go for a run this morning - no procrastination, I just did it and enjoyed it - I guess that's because I've put a hold on the decluttering for now. I too have been following with interest and had come to the same conclusion about my own terrible problems with lack of sleep. It affects everything doesn't it? How did you tackle it? I've read so many books and articles but the stuff they suggest just doesn't help me, I do all that and it seems to make no difference. Rusty, sorry not to have responded to this before. Not sleeping is so hard isn't working it, it affects everything else in your life. I'm still struggling with it, and have ups and downs, but the things I have found work for me are all the things you've read in the books and articles, plus prioritising sleep over other stuff I'd rather be doing. No alcohol, drinking plenty during the day (but nothing in the evening), having enough to eat in the evening so I don't wake up with low blood sugar, and occasionally taking a prescribed sleeping tablet. My GP has been very understanding and supportive,particularly when things were at their worst. I'm working on a post about this on my own blog, so do drop by and have a look - will probably be mid July some time. Good luck - I hope things get better for you soon.